The Hershey Bears fell to the Wilkes-Barre/Scranton Penguins 5-4 in a shootout Sunday evening at Giant Center, dropping their record to 11-13-0-2 on the season. The Bears are back in action Saturday when they visit the Bruins in Providence. Puck drop is 7:05 PM. The Bears picked up right where they left off on Saturday night. After scoring three goals in the third period of their 6-3 win over the Wolf Pack, the Bears registered goals from Jayson Megna and Riley Barber to take a 2-0 lead into the first intermission. The second period would see five goals, three from the Penguins and two by the Bears for a 4-3 Bears lead at the second intermission. The final frame would go scoreless until the Pens scored the tying tally with 41 seconds remaining in regulation. Overtime would go scoreless, sending the game to the shootout. The Pens would win it in the bottom of the ninth in the shootout. 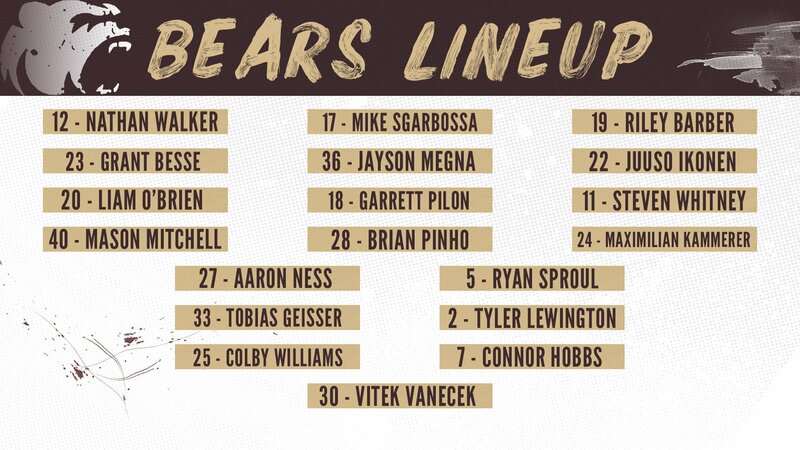 Grant Besse, called up from South Carolina on Saturday, made his first start for the Bears. Riley Barber, who was called up by the Capitals on Friday, was returned to Hershey on Sunday. Beck Malenstyn, who received a 5-minute major in Saturday’s game against Hartford, is suspended until a hearing is held for the incident. Scratches: Kris Bindulis, Lucas Johansen and Shane Gersich missed the contest due to upper body injuries. Hampus Gustafsson and Jake Linhart were the healthy scratches. The Bears would open the scoring with a goal from former Baby Pen Jayson Megna at 4:38 of the opening frame. This was Megna’s seventh score of the season. Colby Williams (8) and Juuso Ikonnen (3) were credited with the assists. The tally came on the Bears second shot of the game. The Bears would be the benefactors of the game’s first power play when Jeff Taylor was called for slashing at 12:50 of the first period, and the Bears would cash in. Riley Barber, freshly back from the Capitals, would pot the Bears second goal of the game at 13:28 of the opening frame. Mike Sgarbossa (9) and Aaron Ness (10) were credited with the helpers. The period would end with the Bears leading 2-0. The Bears outshot the Penguins 8-7 for the first 20 minutes. The Penguins were 0 for 0 and the Bears 1 for 2 on the man advantage for the first period. The Penguins would go on the power play for the first time in the game when Aaron Ness was called for interference at 6:40 of the middle frame, and the Penguins would capitalize. Kevin Czuczman would loft a shot from the left point, that deflected off of Ryan Sproul and continued through traffic and would ultimately float over Vanecek’s shoulder to make it 2-1 at 8:50 of the middle frame. But the Bears would get it right back. Liam O’Brien would finish on a beautiful 2-on-1 break away at 13:41 of the second period. The power play goal was setup by a nice feed from Steve Whitney. Aaron Ness (10) was credited with the second assist. The Bears would quickly make it 4-1 with a beautiful behind the goal play by Tyler Lewington. Lewington would bounce the shot off the back of Muse for the tally at 14:33 of the middle frame. Max Kammerer (6) and Brian Pinho (2) were credited with the helpers. But the Penguins would answer with two quick goals in the final four minutes of the middle frame. Teddy Blueger would back hand a whiffed Pens shot at 16:12 to make it 4-2. Then former Capitals’ prospect Thomas DiPauli would cut the Bears’ lead to 4-3 just before the second intermission, at 19:55. The period would end with the Bears hanging on to a one goal lead by a score of 4-3. The Bears outshot the Pens 13-10 for the middle period, and led 21-17 after 40 minutes of play. The Pens were 0 for 2 and the Bears 1 for 3 on the man advantage after thru two periods. The Bears would return to the power play when the Pens Ethan Prow was called for tripping at 7:29, but the Pens penalty kill was much better on the defense this time, keeping the score at 4-3. The Penguins would tie the game with 41 seconds left in regulation with a goal from Ethan Prow, making it 4-4, and sending the game into overtime. The Bears were outshot 11-4 in the final frame of regulation. The Bears would go to the power play 58 seconds into the extra frame, but could not pot the game winner on the man advantage. The extra frame would go scoreless. The Pens would win it in the ninth round of the shootout. The Penguins outshot the Bears 31-26 for the game. The Penguins were 0 for 3 and the Bears 1 for 5 on the power play. Ryna Sproul led the Bears in shots with 6. This was the 6th of 12 meetings this season between the two teams. Liam O’Brien has scored three goals in the last 24 hours (two games). This entry was posted in News and tagged Hershey Bears, Jayson Megna, Jon Sorensen, Liam O'Brien, Riley Barber, Tyler Lewington, Wilkes-Barre Scranton Penguins. Bookmark the permalink.